During the Christmas Season, horror and mystery old time radio shows did their take on the Holidays Season. 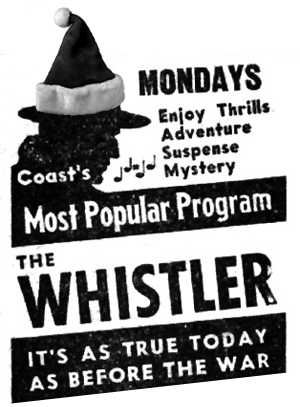 The popular radio shows, The Whistler was no exception and produced a number of tales that would send a shiver even up Frosty the Snowman's spine. The Whistler narrates suspenseful tales of from the killer's perspective, offering a reverse interpretations of the "who-dun-it" genre. The listener know who did the crime, but how will he or she get caught. Often in the case of The Whistler's stories, a simple twist of fate puts the criminal behind bars...or at the gates of St. Peter. A nightclub singer and a gangster are involved in a Christmas gift. This collection includes all Christmas-themed The Whistler old time radio shows. Be the first to comment on "Whistler Christmas"